Hope that you all are doing great! In Madrid, we have been having some rainy and cold days lately. Today, I wanted to finish my post based on Madrid’s Architecture Week. If you haven’t seen it already, I recommend you to check it out (click on this link). As I mentioned in my earlier post,I had the honour of visiting some of the most alluring buildings in Madrid. I will show you an array of photo collages, but also give you a mini explanation of the edifices and what they’re used for. Built & designed by: Rafael de La-Hoz Castanys. Current functions: it’s an auditorium for holding debates and conferences in the city centre of Madrid, close to the financial district and the Paseo de Castellena. It also has the latest video and audio installations. Design style: modern and abstract. Interesting facts: it used to be a garden, so the idea was that the building needed to be transformed into a inhabited garden. So when you’re inside the auditorium; it almost feels as if you’re sitting in nature, because of its bright and transparent exterior views. The Auditorium Rafael del Pino. Built & designed by: Lamela Architecture Studio. Current functions: it’s currently showcasing its innovative bathroom designs and galleries. It also holds educative-social events and even has different meeting rooms for videoconferencing and also has a projection room. Design style: innovative and modern, with a focus on sustainability. Interesting facts: Roca is a Spanish producer of sanitary products (founded in 1917) and is currently present in 135 countries. What strikes me the most is that the entire building itself is has a great design and even their auditorium is state of the art. Year of built: 1879-1880 (inaugurated by King Alfonso XII and Queen Maria Cristina). Built & designed by: a French architect/engineer called Émile Cachelièvre. Current functions: used as a railway museum, but it occasionally holds special events such as popup markets and expositions. Interestingly when the guided tour started, there was a film set at the entrance for the Spanish series of Top Chef and I got to see the contestants run about and I also saw the famous Spanish Chef Alberto Chicote (known for the TV programme, “Pesadilla en la cocina” or Nightmare in the kitchen). Design style: typical iron architecture of the 19th century. Interesting facts: It was the first train station of its grandeur to be built in Madrid (Delicias) with metallic structures. In 1969, the last train with passengers left this station. Finally in 1984 it has been inaugurated as a railway museum (Museo Nacional Ferroviario). Built & designed by: a Catalan architect called José Grases Riera (1850-1919). Current functions: Since the 1950s the Spanish Society of Authors and Publishers has been emitting licences (non-exclusive) for its songwriters, composers and musical publishers. They mainly protect their rights all over the globe. In return they receive royalties for their work (for e.g. musicals, audiovisuals, theatricals or choreography). Design style: Art Nouveau and modern expressionism. Interesting facts: it used to be a residential palace and belonged to the family of the banker Javier González Longoria until 1912. Moreover, between 1912 and 1950 the building went through various transformations. It’s not a surprise that this building belongs to the most emblematic architectures of Madrid. The Spanish Society of Authors and Publishers (Art Nouveau Palace). Built & designed by: Antonio Palacios, Joaquín Otamendi and Manuel Cabanyes (renovations and expansion). Current functions: Since 2006 it has been the central office for the promotion of the Spanish culture and language. The organisation (non-profit) itself has been created in 1991 by the Spanish government. It’s currently being used for expositions and cultural events (literature, such as Don Quijote). Design style: eclecticism (from the period History of Art) and Greek neoclassical. Interesting facts: It’s named the building of Cariátides (ancient greek) for its sculpted female figures, which are the columns at the main entrance. The building used to be owned by different bank entities (1918-2000), such as the Banco Español del Río de la Plata, Banco Central, then Banco Central Hispano and the Instituto de Crédito Oficial. 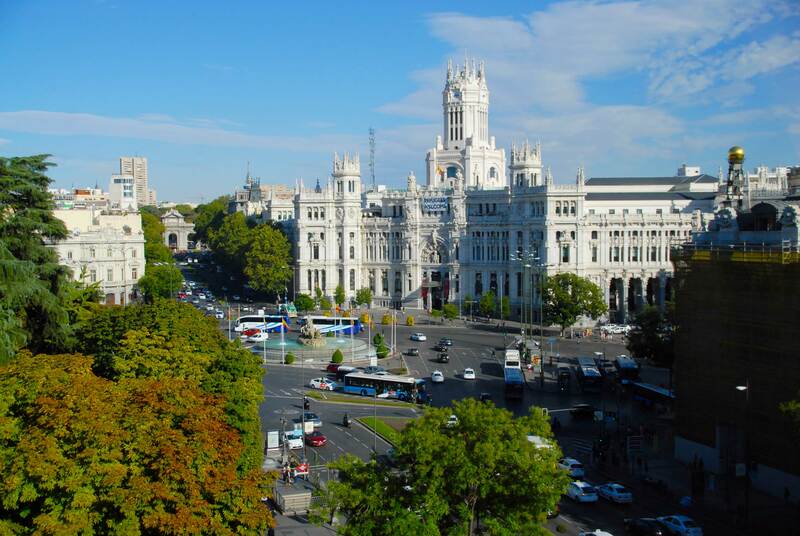 In 2003 it was bought by the Community of Madrid and finally in 2006 it was inaugurated by the royal Spanish family as the first entity of the Instituto Cervantes. I took this picture from the Instituto de Cervantes. Here you can see (from left to right), Casa de America, the Puerta de Alcalá (monument), the Palacio de Cibeles and in the shadows the Banco de España (Bank of Spain). Year of built: the project started in 1904 and the construction was finalised in 1911. Built & designed by: architect Joaquín Saldaña. Current functions: the North American institution offers courses in English, cultural activities and it has an library with an extensive range of English literature. Design style: North American and influences of English female colleges. Interesting facts: The most important pioneers of the institution were William Gulick and especially his wife Alice Gorden Gulick (1847-1903), who wanted Spanish women to have access in education and eliminating possible barriers. Alice Gulick also had a boarding school at home for girls. The Gulicks were the ones who acquired the building in 1901 and they had implemented the Free Teaching Institution. Sadly Mrs Gulick passed away in 1903, in the same year that the institution had been inaugurated. It was declared a Historical-Artistic monument in 1982 for its construction and nobility of materials used. Year of built: 17th century (1735-1740). Built & designed by: Pedro de Ribera (Church), Francisco Rivas (college & convent) and Ventura Rodríguez (fuente de los Delfines, fontain of the dolphins). Current functions: school of professional architects of the Community of Madrid (Spain). Interesting facts: Before the building was a school of architects of Madrid, it used to be a church/hospital, a college and even a convent. The inauguration of the headquarters of COAM was in 2012, after being a college (Escuelas Pías de San Antón, until 1989). The school of architects of Madrid, COAM. After having lived three 3 years in Madrid, I realise that there so much to learn about the different architectural buildings. Every one of them had a history to tell, but my fave buildings in this post are: the Spanish Society of Authors and Publishers (Art Nouveau Palace) and the Instituto de Cervantes. I haven’t study anything in architecture, but as a fan of Art Nouveau I do admire other types of architectural designs. Wishing you a nice Sunday and coming week!